The Simms/Mann Family Foundation has partnered with Sharewell to create a health and wellness overlay at the new Cayton Children’s Museum, entitled “Simms/Mann Habits for Health.” ShareWell, the Los Angeles-based non-profit that inspires youth to be their best selves through high-caliber arts and youth development programming, will officially open the doors to the all-new Cayton Children’s Museum in early summer 2019 in Downtown Santa Monica. The new museum, formerly known as the Zimmer Museum, will be located on the third floor of the popular open-air shopping destination, Santa Monica Place, resulting in higher visibility and a broader reach to the many diverse neighborhoods of the greater Los Angeles area. 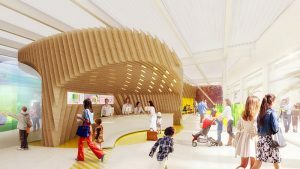 The 21,000-square-foot facility will nearly double in size from the museum’s previous location, offering hands-on exhibits and a robust calendar of arts and cultural educational opportunities for children, youth and families. The Simms/Mann Family Foundation wants all children and families to be aware that in order to thrive, our bodies and brains need food, water, sleep, movement, play, reflection, and connection. Simms/Mann Habits for Health at the Cayton Children’s Museum will offer fun ideas for integrating these aspects of wellness into our lives, with iconography and educational content incorporated throughout the museum and online.